Graph showing final results from capstone research. 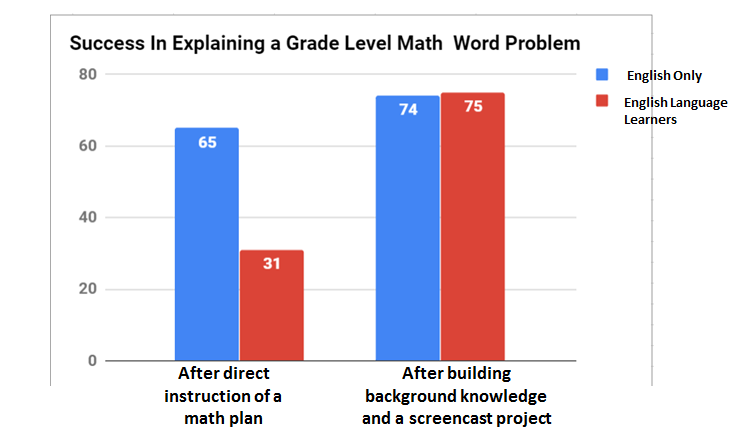 In setting out to discover ways to help students describe mathematical processes to solve word problems, it was not my intention to focus particularly on English Language Learners (ELL's). However, the proof is in the pudding, so to speak, significant results in this study are primarily found in my ELL students. By providing ELL students with the background knowledge they need to participate fully in the treatment, their success rates increased dramatically. This is in direct correlation with values set forth by Touro University. In giving students the tools they need to succeed, they develop a sense of "Intellectual inquiry (and) discovery..." it also promotes a "...passion for life-long learning." While providing my ELL's with the necessary background knowledge to be competitive, with English only speaking students, they are met with "Acceptance and appreciation of (their) diversity." ​Quantitative data, for this study, showed no significant difference in using decentralized collaborative group work, however collaboration did allow each student to contribute to the finished assignment. Each student was accountable for their own slide and script in a screen-casting they put together at the end. Working in groups promotes the Touro Value of "Collaboration and (promoting) a sense of community." In giving each student a role in their group the process focuses on "Student-centered education." Technology also played an important role, by proving the students with a platform to express their ideas, they were able to solidify what they had learned and go on to find deeper understanding through teaching. In this way each students thoughts were given the proper "Respect for the inherent value and dignity of each individual," and in becoming student teachers they were able to develop "Compassion (for one another) and (become a) service to (their own) society." There was some promising data to show a positive effect of background knowledge, digital intervention, and Direct Instruction to inspire future studies. The study should be extended to find the effect working with partners and using tutorials and games has on English Language Learners and to what degree that practice provides background knowledge such that all students are able to fully participate in collaborative groups. It would also be interesting to discover the effects background knowledge providing techniques has on each step of the mathematical decryption process, beyond identifying the interrogative. When such background knowledge is established, further research should be done on the effectiveness of direct instruction to students with this knowledge. It would be valuable to include both quantitative and qualitative data concerning student engagement in digital projects created to solve real world problems. And to repeat the process to find what degree background knowledge and direct instruction effect student comprehension, critical thinking and explanations in a grade level math word problem.